After its first year, has the new 4K home cinema disc format lived up to expectations? Viewing an Ultra HD Blu-ray obviously requires an Ultra HD TV. The latter have been around for yonks, but are perhaps only now earning their crust (thanks to Netflix, Amazon, Sky, Wuaki.TV and games consoles also streaming in 4K). Yet it's fair to say that Ultra HD Blu-ray has upset the apple cart a touch. And it all boils down to HDR. High Dynamic Range has been the format's secret weapon. When AV enthusiasts first began imagining a turbo-charged Blu-ray standard supporting 3,840 x 2,160 resolution, HDR didn't even cross our minds. It simply wasn't being talked about. Yet as the wait for 4K Blu-ray dragged on, HDR entered the frame (if you'll pardon the pun). And the challenge of delivering HDR video – as well as a wider colour gamut – has sent TV brands scurrying to their R&D labs. HDR provides for greater levels of both shadow detailing and bright image detail. TV manufacturers like to demo it with bursting fireworks, hazy sunsets or dimly-lit rooms. In such instances, an HDR signal will find more info in dark and light areas, benefiting from a greater dynamic range. SDR, by comparison, will miss out on that extra detail and impact. This is the theory at least. Yet not all TVs are created equal, and we're not just talking about OLED and LED variants. We've seen a backlight arms race take hold, with manufacturers striving to deliver the 1,000-nit-and-above peak luminance levels that Ultra HD Blu-ray content is mastered to. And such potent backlights – as seen on models such as Sony's ZD9 or Samsung's QLED TVs – need marrying to precision. The efficiencies (or limits) of full-array local dimming systems and edge LED implementations have been ruthlessly exposed. What are we talking about here? Clipped areas of bright detail in sets that struggle to hit the required nit levels; vertical light banding on edge-lit TVs when tasked with bright objects on dark backgrounds; haloes around objects when local dimming systems lack pin-point accuracy. Such criticisms – plus colour banding – crop up in our reviews as seemingly no one has mastered the art of unlocking the full potential of Ultra HD Blu-ray. This is a situation not helped by the static metadata approach of the HDR 10 standard, which essentially leaves a TV up to its own devices. The good news is that such flaws are easily overlooked. Ultra HD Blu-ray can appear utterly gorgeous, and make traditional Blu-ray feel lifeless by comparison. And there's a very healthy range of screens to choose from, to the point where, even at this early stage, an Ultra HD Blu-ray experience needn't come at a premium. AV enthusiasts will always salivate over the big-brand flagship models, but many will then turn their attention elsewhere. Spendthrifts can still get a convincing, rewarding 4K HDR experience from a step-down model. 2016 sets like Panasonic's DX750 range and Samsung's UEKS7500 bring obvious image quality improvements with 4K BDs over regular Full HD/SDR material, but won't break the bank. Those image quality niggles mentioned earlier may be more pronounced, but far from disastrous, and the absence of a completely wide colour gamut on some affordable panels is easy to swallow – especially if you remember the money you've saved. Non-HDR capable 4K TVs are being phased out. This is a welcome move, as Ultra HD Blu-ray looks its best with that extra dynamism in play. We wouldn't advise buying any TV now that isn't HDR ready. Ultra HD Blu-ray is also giving new impetus to the OLED vs LED battle, as rivals – predominantly Samsung and LG – lay claim to why their technology is superior with the new disc source. It mostly boils down to nits. Improvements with OLED luminance still haven't brought it to the level achievable from LED-lit screens. At the same time, however, OLED still enjoys the true black advantage it always has. Choosing between OLED and LED needs to be based on preference – there's a more organic feel to OLED imagery that some will favour over LED light-cannons – and price. LED-lit TVs still dominate the mass market. The choice of 4K disc spinners, although slowly expanding via 2017 players from LG, Sony and Cambridge Audio, is limited. Thankfully, there's enough variance in price point to still have practically every consumer base covered. If you haven't got a lot to spend and have little interest in using your player as a music machine as well, then Microsoft's Xbox One S, Panasonic's DMP-UB300 or Samsung's UBD-K8500 are all up for consideration. Build quality and user experience with these machines may be a little rough around the edges, but they bring Ultra HD Blu-ray playback to a wide market. Oppo's UDP-203 works as an almost like-for-like replacement (minus Darbee Vision) of its BDP-103D deck, retaining SACD/DVD-Audio playback and HDMI switching, while Panasonic's DMP-UB900 brings hi-fi sensibilities and legacy connections to a full-width design. The latter two are among the priciest around, yet both sell for less than £700. Ultra HD Blu-ray players simply haven't arrived with the high price points that some feared, so we'll give a thumbs up here. Nor are there Profile 1.1/2.0 issues to worry about, as there were with Blu-ray. But we still have some qualms. Firstly, there's the thorny issue of output selection. Using an Ultra HD Blu-ray deck comes with options to consider – 12-bit? 10-bit? 8-bit? 4:2:0? – that marry to the particular nature of your partnering display. Some players are flexible in their options, others less so. For mass-market consumers, it's probably a level of complexity they could do without. Secondly, there's firmware to keep on top of. While preferable to the fiasco over Profiles that blighted Blu-ray's early years, having players undergo after-market tweaks illustrates an industry still coming to terms with the format. Oppo UDP-203 owners have already witnessed three firmware updates; Panasonic is bringing a 10-bit priority mode to its UB900 and UB700 decks via firmware. Lastly, Dolby Vision support is the bane of all Ultra HD Blu-ray player buyers. This optional part of the 4K format specification (alongside mandatory HDR 10) remains an unknown quantity, as little software has been released. So, do you need Dolby Vision, or can it be ignored? Well, if the TV you already own can handle the format, it makes sense to invest in a player with similar chops. If not, then don't worry about it, unless you plan on upgrading your TV before your deck. Just be careful to check specs when buying and don't think hardware companies are obvious when it comes to format loyalty – Sony's newest TVs may support Dolby Vision, but its UBP-X400 player doesn't. For some home cinema fans, projection is their passion, and not even a super-size TV comes close. 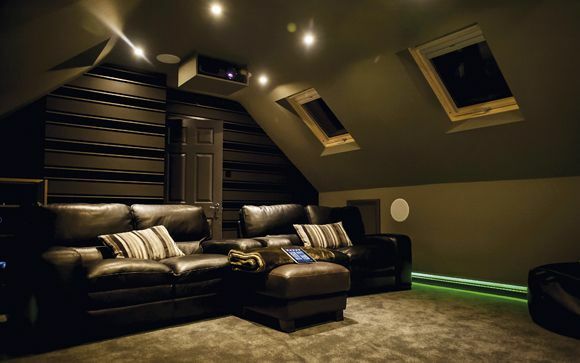 Bigscreen, lights down, feet up – sorted. The limited choice, and performance issues, of Ultra HD Blu-ray-capable projectors has therefore been a problem. 4K playback on projectors isn't new, arriving via Sony's SXRD range in 2012, but the complementary support for HDR is more recent. Sony and JVC both introduced compatible models in advance of the Ultra HD Blu-ray player launch, while Epson, Acer and others have since followed. Yet working with the higher brightness demands of 4K HDR movies, while retaining strong base black levels, is proving something of a stumbling block – even top-end models aren't immune. And the resolution element of Ultra HD Blu-ray has slowed down the projector revolution, too. Most 3,840 x 2,160 home cinema projectors remain too expensive for the majority of home cinephiles to begin considering. Sony's most affordable 4K model – the VPL-VW320ES – sells from between £6,500-£7,500, which is hardly pocket-change. (It actually began life being more affordable, at around £5,800. Presumably currency fluctuations are to blame). You can get Ultra HD Blu-ray playback for less, of course. Epson and JVC will furnish you with HDR-ready models that employ 4K upscaling/pixel-shifting systems, plus the necessary HDMI connections, to spin a 4K disc. And 4K DLP technology, from Texas Instruments (TI), has seen a number of more affordable models arrive, with variety in pricing and specification to boot. At present, however, there's a big gap between the sizable projector market below and around £1,000 and the new 4K HDR options. Upgrading from your budget beamer requires a considerable outlay. For projector enthusiasts it's a bitter pill to swallow when they can see Ultra HD Blu-ray capable TVs on high street shelves for as little as £500. The smart choice right now actually may be to go for a twin-screen setup. Software: any home cinema format lives or dies by its movie selection. First, the good stuff. Ultra HD Blu-ray isn't suffering from wavering studio support or tedious exclusivity deals. With no immediate rival, a la HD DVD, to muddy the waters, 4K Blu-ray has had the weight of Sony Pictures, Universal Studios, Paramount Pictures, Twentieth Century Fox, Warner Bros and Lionsgate behind it from day one. This all equates to a wide selection of movies. Sort of. Fans of big-budget franchises – X-Men, Star Trek, Bourne, Fast & Furious, those kooky Dan Brown movies – have been rewarded, while heavyweight standalone flicks such as Deepwater Horizon, The Revenant, Oblivion, Mad Max: Fury Road and Everest have all seen the inside of a 4K slipcase. Nor is the format being reserved for explosive fare. Every genre from stoner comedy (Pineapple Express) to gritty thriller (The Town) has been welcomed aboard. One question immediately arises, though. Where's all the catalogue stuff? Back-catalogue material, and by that we mean deep stuff, not just a Ben Affleck political drama from 2012 – is perhaps the particular concern of the die-hard AV enthusiast. The man on the street may be happy with Ultra HD Blu-ray releases being predominantly new movies, but we want it all, and our interest goes back decades. After all, wasn't the point of the new format to bring fresh life to old titles, and give us a chance to see, say, Apocalypse Now as it would have looked at the multiplex in 1979? Sony Pictures, always a smart thinker when it comes to its library, is at least trawling archives and bringing out the likes of Labyrinth and Crouching Tiger, Hidden Dragon. We're grateful, but can't ignore the somewhat random nature of its selections. Other studios appear to have sights firmly set on the here and now. This all means that any plan you may have had of upgrading your entire film library to UHD disc is going to be a slow-burner. And we wouldn't want to get your hopes up. The sad truth is that these days catalogue material is a hard sell on Blu-ray, and is the reason that boutique labels, operating with limited edition policies and enticing collectors with natty packaging, are able to license titles from majors in the first place. There are films that we know exist with 4K masters still unannounced on UHD Blu-ray – look at collections on Amazon Prime and Sky Q. The avenue for catalogue 4K material, outside of the obvious big titles, could well be streaming. Disc replication cost = zero. Moving away from film selection and on to image quality, and Ultra HD Blu-ray has been a rollercoaster of emotions. Some titles are so gorgeous to look at it hurts, others hurt in a different way. There are numerous factors at play here. The resolution of digital masters used, quality of encoding, HDR grading choices, superior or inferior cinematography... Mix these together with the image-affecting variances of Ultra HD TVs discussed earlier and it's easy to see why it's hard to nail down what a uniform Ultra HD Blu-ray image should look like. The end result is that we love discs for films we used to hate (Angels and Demons) and hate discs for films that we used to love (GoodFellas). Applause again goes to Sony. Its titles based upon 4K masters derived from film (Crouching Tiger... for instance) have shown nuanced HDR grading and exquisite detail. Yet even its releases based upon 2K sources (The Magnificent Seven, The Shallows) have been show-stoppers. This ker-azy high-concept sci-fi thriller arrives on UHD Blu with an image that's as dazzling as Lucy's super-powers. While shot digitally with a mixture of different resolutions, it all comes together as a blisteringly sharp 4K image that warrants close inspection. Even better, Universal has resisted any temptation to over-push Luc Besson's naturalistic lighting into something more obviously eye-catching. Throw in richer colours and a pristine master and it's simply a better all-round experience than its Full HD SDR release. Pick this, or one of the other two entries in the Tom Hanks art-history-mystery series (The Da Vinci Code, Inferno) – all three are eye-opening introductions to the beauty of 4K Blu-ray. You want Ultra HD detail? This image oozes pixel punch, letting you bathe in the glory of director Ron Howard's Vatican City set design, or Hanks' steely grimace. Contrast is expansive, leaving the bundled 1080p version to feel dull and shut-in. Most importantly, it looks effortlessly natural. Sony Pictures' UHD release for Ang Lee's now 17-year-old martial arts fantasy boasts an image that just looks right. It's sharp without exaggeration, doesn't hide its 35mm origins, and finds extra detail in dark sequences while catching the eye with bright splashes of colour. That the effort has been made to remix audio into Dolby Atmos is the icing on the cake. All that's left to is sit back and enjoy the wire-work fight sequences. Warner has set the standard for its other UHD releases to follow with this wonderfully balanced 4K HDR picture. Shot digitally, mastered at 4K and then graded for UHD Blu-ray with a magician's sleight of hand, it captures the crafted beauty of the period New York setting, and scads of fine detail in its human cast and superior CG creations. Nuanced colours range from sparkling golds and deep, rich blues to cool whites. Another Sony Pictures catalogue release that impresses due to its authentic feel. Scanning the original 35mm elements at 4K yields a sharpened image, but without hint of naughty grain removal. In fact, it's the grain levels here that may upset those who prefer their 4K slick and smooth. Get beyond that, though, and appreciate not only the improved detail, but the extra luminosity created in the HDR suite, and increased colour subtlety. A new Atmos soundmix is a factor in recommending this big-monster sci-fi for a rewatch, as is Warner's consistently involving 4K HDR upgrade. True, the original Full HD release is no slouch in terms of image quality, but this creates a future world that's even easier to lose yourself in. Detail levels are high, but it's the dynamic nature of the picture that really stands out, with deep blacks and searing neon hues. No 3D option, of course, but Pacific Rim in UHD still packs plenty of depth. Give your cinema room a change of pace with the BBC's peerless natural history doc – it'll have you wishing 4K HDR broadcasts weren't just an idea for the future. The wonders of the world are on full display here, and the six-episode series frequently produces jaw-on-the-floor moments of visual splendour. There's depth, detail, colour subtlety, black level punch and smooth blends in abundance, buoyed by the Beeb's craft in weaving it all together. Perhaps the first absolute must-have UHD title, which sees the achingly beautiful, Oscar-winning cinematography of Emmanuel Lubezki turn this harrowing drama into a feast for the eyes. Famously shot using only natural light sources (sunshine, fires, candles, etc), it's a sumptuous demo disc awash with vibrant greens, lurid reds and icy whites, and a wide dynamic range. Clarity is excellent, too, with markedly more detail than in the also great-looking 1080p release. Beam yourself up to a colour-rich, high-brightness sci-fi spectacle where inky black space truly looks inky black and even director J.J. Abrams' overuse of lens flare effects almost makes sense. Yes, this is based around a 2K master, but it never feels like anything less than a worthwhile upgrade; colour and contrast increases are joined by finer appreciation of textures. Both sequels (Star Trek Into Darkness and Star Trek Beyond) also scrub up well. The most recent X-Men adventure is a good showcase for how attractive a modern title can look on 4K disc. Source quality plays its part here, as the movie was lensed digitally at above 4K resolution and mastered at 4K – albeit with heaps of lower-res FX work – but the impact also comes from the lush, vivid wide colour grading and HDR details. Primary colours are pushed high, ensuring a comic book image with plenty of pop. It's clinically clean and crisp, too.